This job can take quite a while from start to finish. Plan on taking most of one day to complete it from start to finish. 2. Remove the entire exhaust system. If you have a stock exhaust you will need to disconnect the cables to the htev. 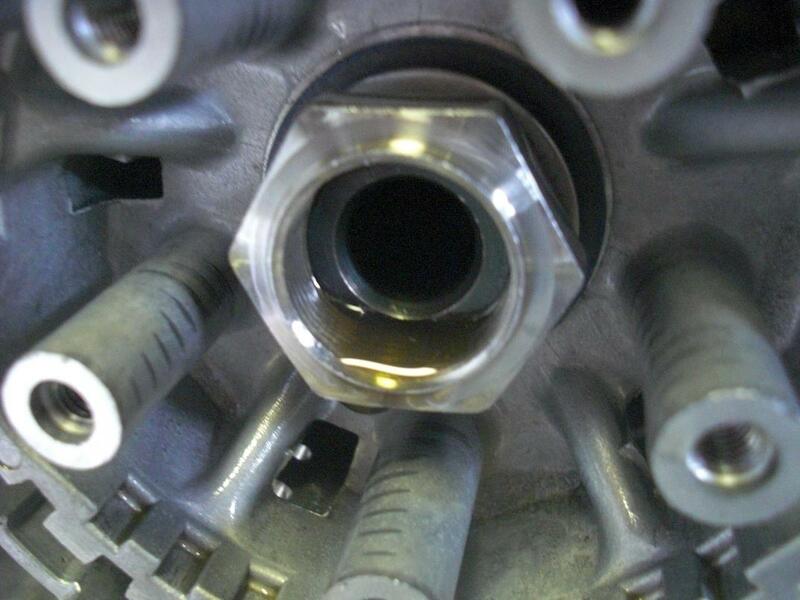 If your exhaust has never been removed you may want to spray the nuts (10mm) holding the header to the engine with some type of penetrating oil to help loosen them. Try not to remove the studs from the head. Also you will need to order some new exhaust gaskets. 3. With the exhaust removed its time to drain the oil from the engine. Drain bolt is 14mm. I would recommend replacing the stock drain bolt with one from Ebay that contains a magnet. Replace the drain plug in the pan so it does not get misplaced. 4. Now you can loosen the 10mm bolts securing the oil pan. There is a pry tab on the both sides of the oil pan to help break it free from the engine once you have all the bolts removed. 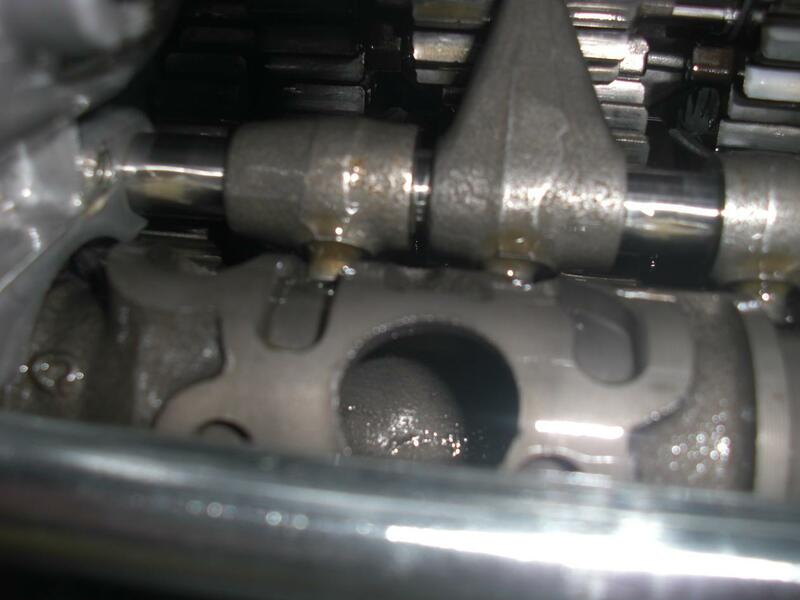 Be prepared for oil to drip everywhere once the oil pan is removed from the engine. I use large absorbent pads under my bike to catch any oil that drips from the bike. You can now inspect the shift drum for wear. Take plenty of pictures from here on so can refer back to them when installing your new parts. 5. Pull down on the oil pickup and remove it. This is a good time to clean any debris that has accumulated on the screen in the pickup over time. 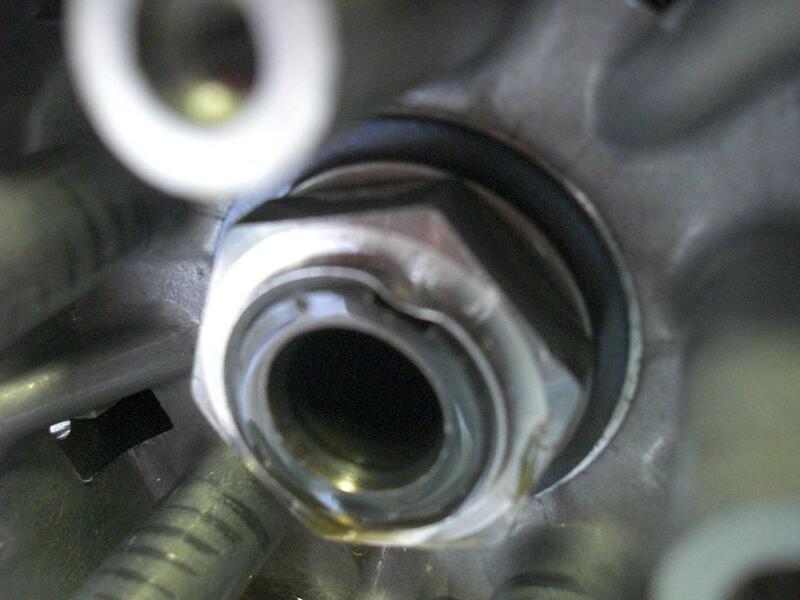 You can also remove the oil pressure relief valve by pulling down on it too. It can be taken apart and checked. Mine was good. 6. Now its time to remove the clutch cover. Prop up the gas tank and while standing on the left side of your bike reach across and behind the airbox with your right hand and disconnect the small red plug on the right side going to the signal generator mounted to the clutch cover. DO NOT WAIT AND REMOVE THE SIGNAL GENERATOR FROM THE COVER. 7. Remove all the 8mm bolts securing the clutch cover. Once the clutch cable bracket bolts are removed the cable can removed from the clutch actuator and laid back on the engine out of the way. 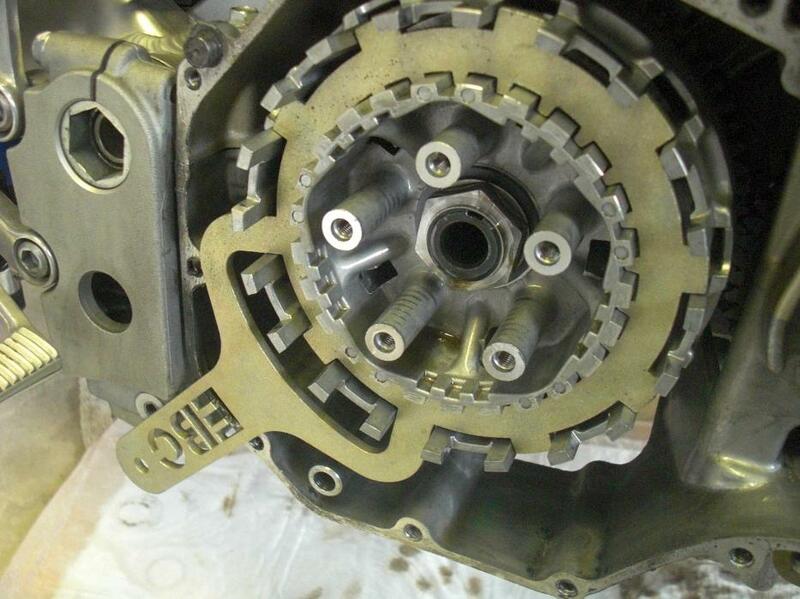 Rotate the clutch actuator to your left to where its pointing to the rear of the bike. Now using a hammer gently pry on the pry tabs to loosen the clutch cover. Place the cover in a plastic bag or somewhere to keep it clean. 8. You will now see the clutch pack. Using a 10mm socket slowly remove the bolts securing the clutch springs. Be sure to keep the following parts in the correct order to help you later in reassembly. Remove the pressure plate making sure the bearing stays with it. Next pull out the lifter pin. Slowly remove the clutch plates. Notice: THE LAST FIBER SITS IN THE SHALLOW SLOT ON THE BASKET. Inspect each fiber and measure them with a micrometer to make sure they are still within spec and do not need replaced. Place each one with the surface facing out towards you down. (A small plastic bowl works great to keep them in the correct order) Continue removing each steel and fiber until you remove the last thinner fiber and the judder seat and spring. If your clutch plates are good then fill the bowl with fresh oil and let them soak until its time to put them back in the bike. 9. 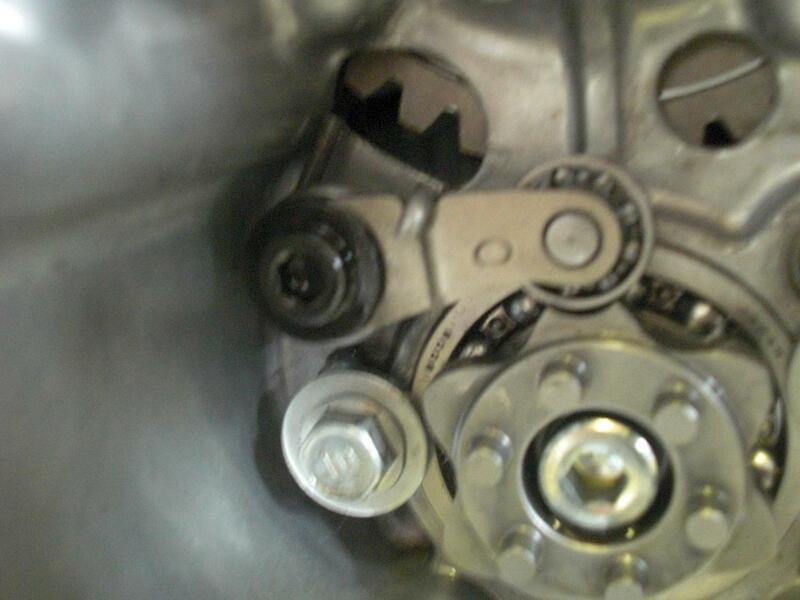 Now its time to remove the lock nut securing the inner clutch center and basket. You can purchase a clutch holder tool from EBC for around $20. Don’t try to make something that will damage the clutch basket or clutch center and cost you even more money. The tool is worth it. There is no need to unstake the lock nut. 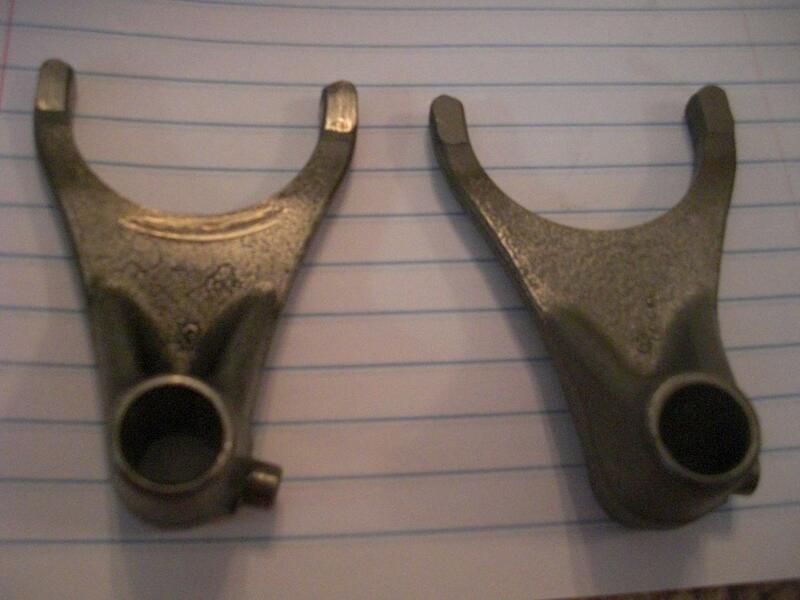 Place the clutch holding tool into the deep slots on the outer basket and let the handle rest on the brake lever. Using either a pry bar or impact wrench with a 30mm socket loosen the lock nut (A NEW LOCK NUT WILL BE REQUIRED). Remove the lock nut and the 2 washers behind it. Keep them in the correct order. Slide out the clutch center. There will be a large flat washer between the center and the outer basket. 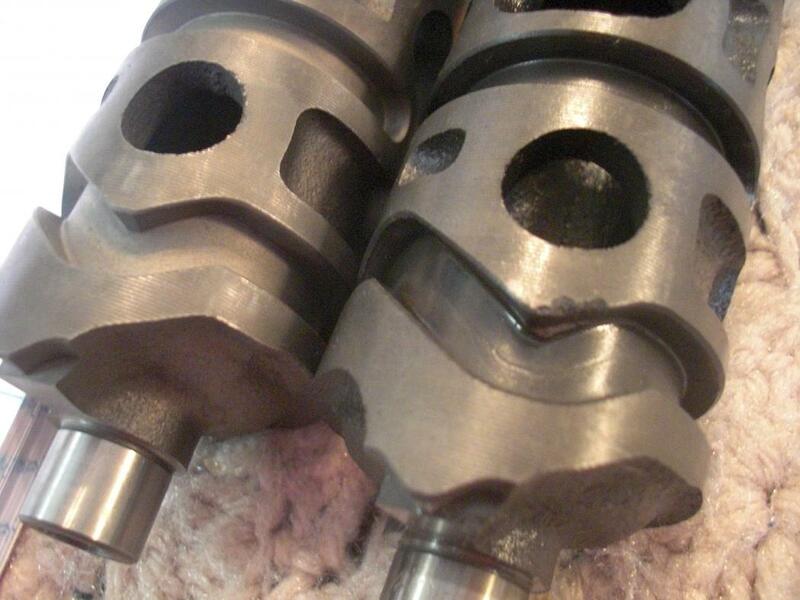 The outer basket is tight against the scissor gears on the crank and requires some effort to pull it out. If needed place a Phillips head screwdriver in the hole above the ignition rotor and release the tension on the scissor gear then pull out the hub with your other hand. This is how we will reinstall the outer hub later. 10. Now you will have the entire clutch assembly out of the bike. Next you need to remove the shift lever on the left side of the bike. Loosen the 10mm bolt and slide the shift mechanism off. Note the dot on the end of the gearshift spindle and how it aligns with the space on the lever mechanism for when you reassemble it. 11. Pull the gearshift spindle out the ride side of your bike to expose the shift star and lever. 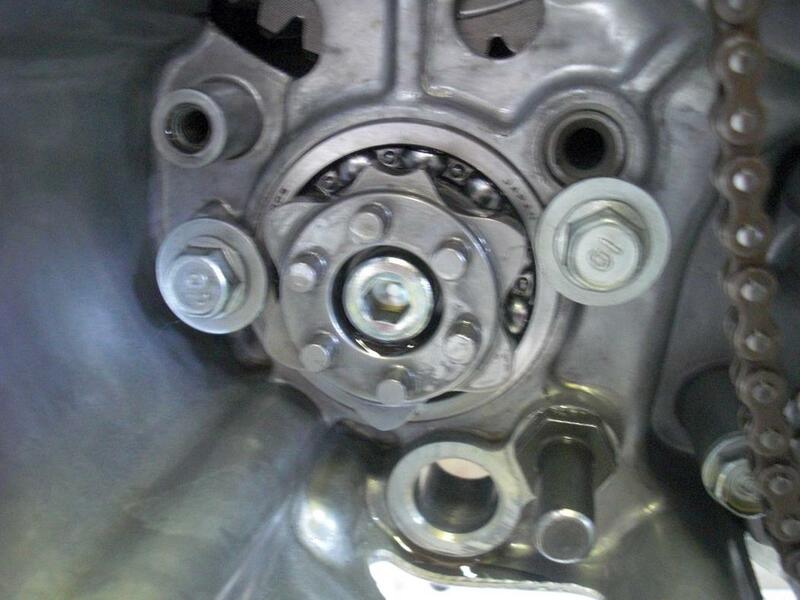 There will be a thrust washer that stays with the gearshift spindle. (I replaced the return spring on the backside of the gearshift spindle. For only a few bucks why not.) Remove the 5mm allen bolt securing the lever arm and remove the bolt, washer, spring and lever arm. 12. Now remove the (2) 10mm bolts on each side of the shift star holding the shift drum. 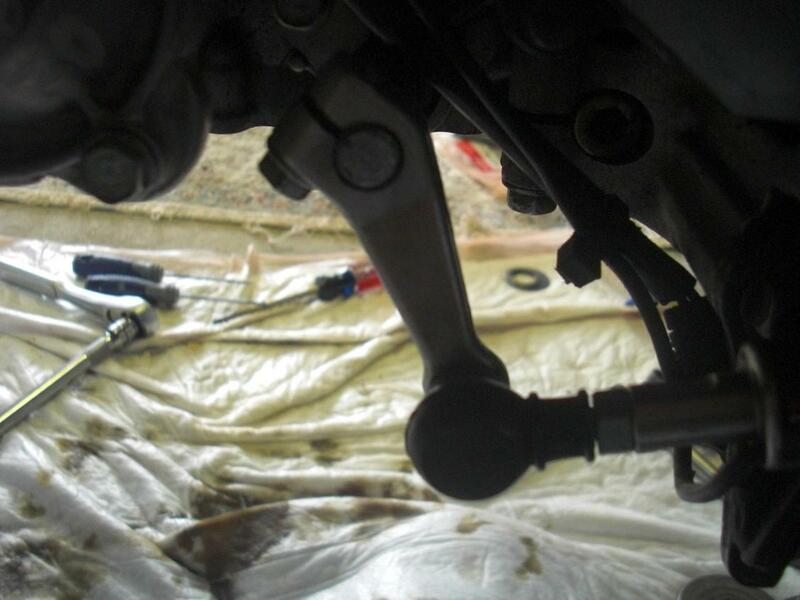 The right bolt is also securing the shift shaft that the shift forks are mounted on. I recommend you to take plenty of pictures to help you with putting all of this back together. 13. Reach up through the bottom of the motor and slowly slide out the shift shaft. Once its started to where you can hold the shaft beside the shift star slowly slide it out to where the left shift fork is free and remove it. 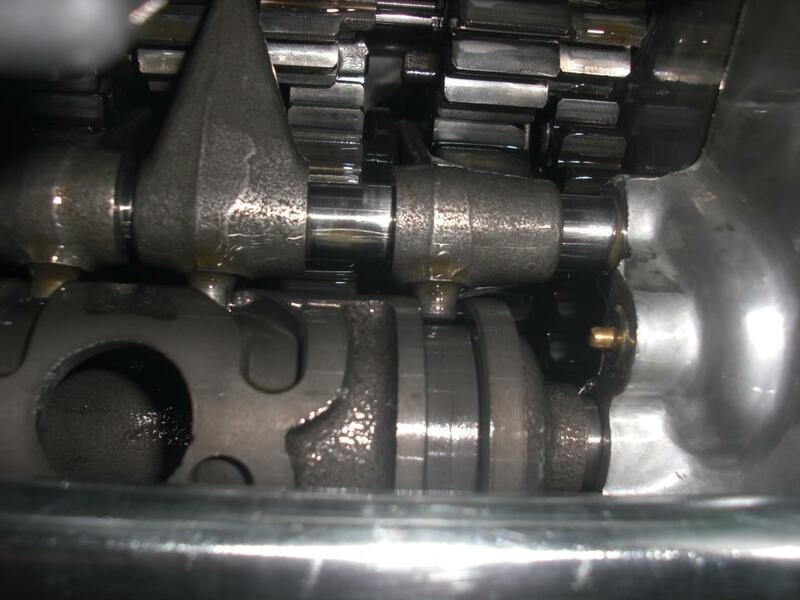 Continue this process to remove the center and right shift fork. Make a note of how each shift fork is positioned and the groove that each rests in on the transmission. 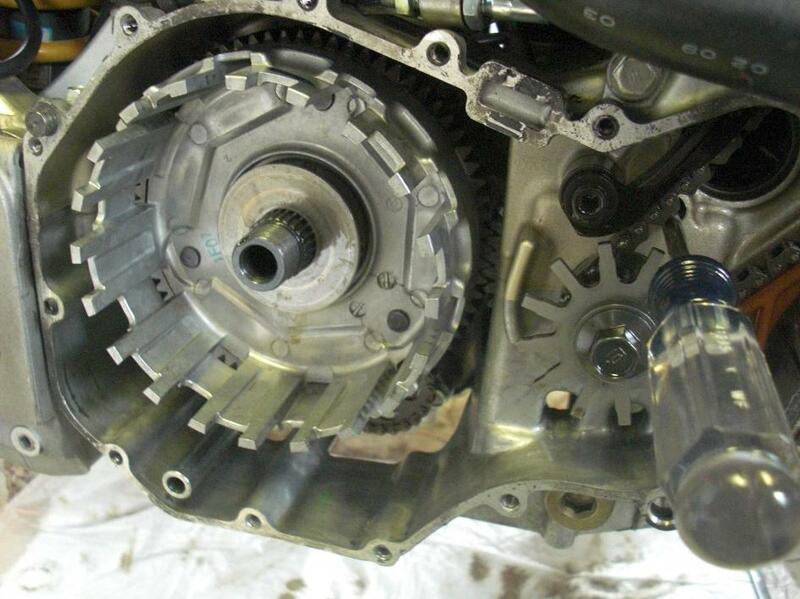 Now that the shift shaft and forks are removed you can pull the shift drum out. 14. Inspect the drum for wear. Mine was severely worn (see pic) where the left shift fork sits for second gear. Inspect the tips of each shift fork for wear, signs of heat and for scoring along the bottom as seen on my left fork. My left fork was below spec and had visible wear rings. The center and right fork were barely above spec and had very early rub marks. The shift shaft that holds the forks also measured below spec. You can replace these with used parts but for the amount of work involved and to make sure its done right I ordered all new parts from partszilla.com. I am replacing the drum, all 3 shift forks, shift shaft and the return spring on the gearshift spindle. 15. Once you have all the parts its time to reassemble everything. 16. Coat the new drum and bearing in oil and place the new shift drum into the engine with the flat spot for neutral pointing up. Lay out the shift forks in the correct order and get familiar with which direction they point in the engine. The identifying marks should point to the right on each shift fork. Place the right fork facing towards the rear tire into the correct gear slot and slot on the drum and slowly insert the shift shaft into the fork. Next place the center fork facing towards the front tire and continue to insert the shaft. Repeat with the left fork facing the rear tire and completely insert the shift shaft until it seats into the engine case. 17. Place loctite on the bolts securing the shift drum and shaft and tighten to 9ft/lbs or 108 in/lbs. 18. Next install the shift spring then washer, lever arm and bolt. Make sure to install the spring correctly or it will not have the correct tension. The loop fits over the lever arm and the straight end with be at the back and pointing up and to the left. You will need to use a screwdriver to pry up the lever arm to install the bolt. 19. Install the gearshift spindle making sure to put the washer on before inserting it through the motor. Reattach the gear shift pedal. Make sure you align the dot on the spindle with the space on the pedal assembly. At this point you can check the transmission for proper operation. While lying under the bike where you can see the shift drum, forks and transmission rotate either the rear wheel or output shaft and shift bike into 1st gear. It should work smoothly. Continue and shift to 2nd then 3rd, 4th, 5th and 6th gear. Each gear should work smoothly. Now repeat for downshifting and go back to 1st gear. If you are unable to shift through the gears at this point then stop and recheck your work. You have done something wrong and should not proceed until you correct the problem. 20. Now it's time to install the clutch assmbly. 21. 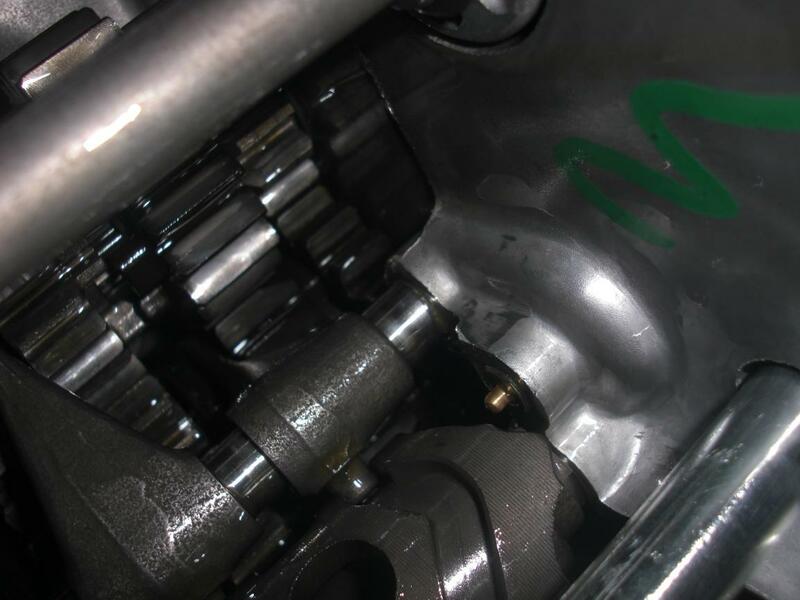 Use a screwdriver in the hole above the ignition rotor to align the scissor gears on the crank and reinstall the outer basket making sure its sits on the tabs to drive the oil pump. With the oil pan off you can look up behind the basket and slowly turn the oil pump to align the tabs with the clutch basket. 22. Next place the large flat washer then the clutch center. There will be 2 washers with OUT readable on the second washer. Install a new lock nut some fresh oil on the threads. 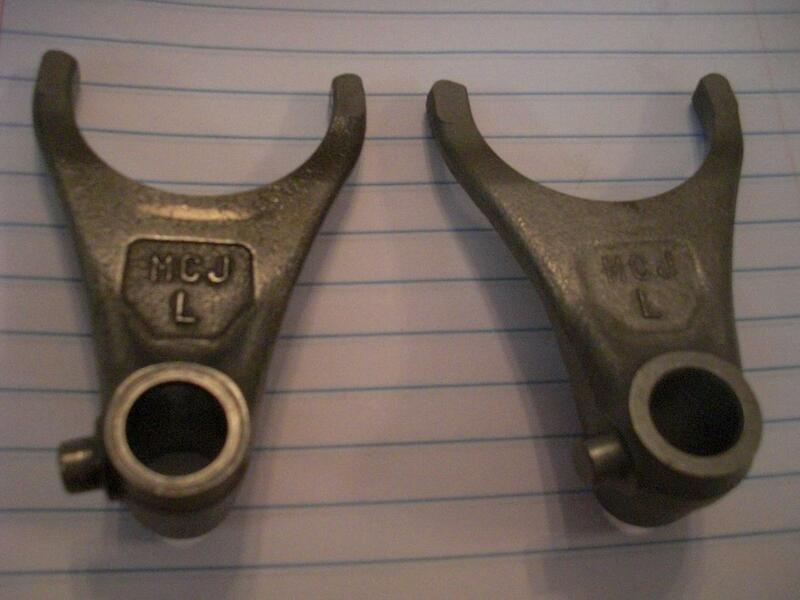 (DO NOT USE LOCTITE) Hold the clutch with the clutch holder tool and tighten the lock nut to 94 ft/lbs. Using a punch stake the lock nut on the shaft. 23. Install the judder seat and spring. The spring will have the outer edge facing out. Next will be the thinner clutch plate into the deep slot. Alternate between steel and fibers until you reach the last fiber. Place the last fiber in the shallow slot. Install the lifter pin then the pressure plate. Install the clutch springs and bolts. Slowly tighten them in a crisscross pattern to 9 ft/lbs or 108in/lbs. 24. After cleaning the surfaces of both the clutch cover and side of the engine place a very thin coating of Ultra Black silicone on the cover. 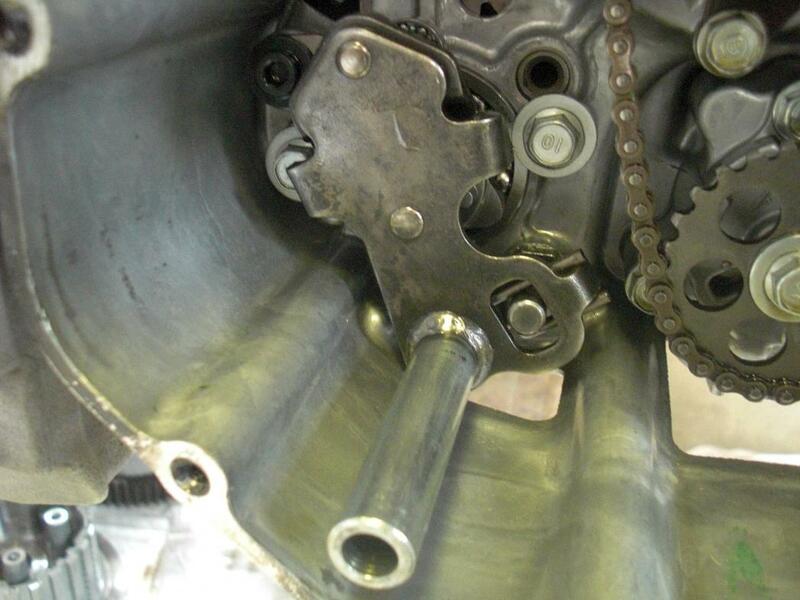 Make sure the dowel pins are either in the engine case or the side cover along with the clutch actuator facing to your left and install the clutch cover. Rotate the actuator to the right to engage the lifter pin and attach the clutch cable before installing the bolts for the clutch cable bracket. Tighten the cover bolts in a crisscross pattern in the 2-3 steps. No torque is given in the manual but these do not need to be really tight. I use a 1/4 socket wrench to install these bolts. Now reconnect the red plug to the signal pulse generator. Its easier to do from the left side of the bike. 25. 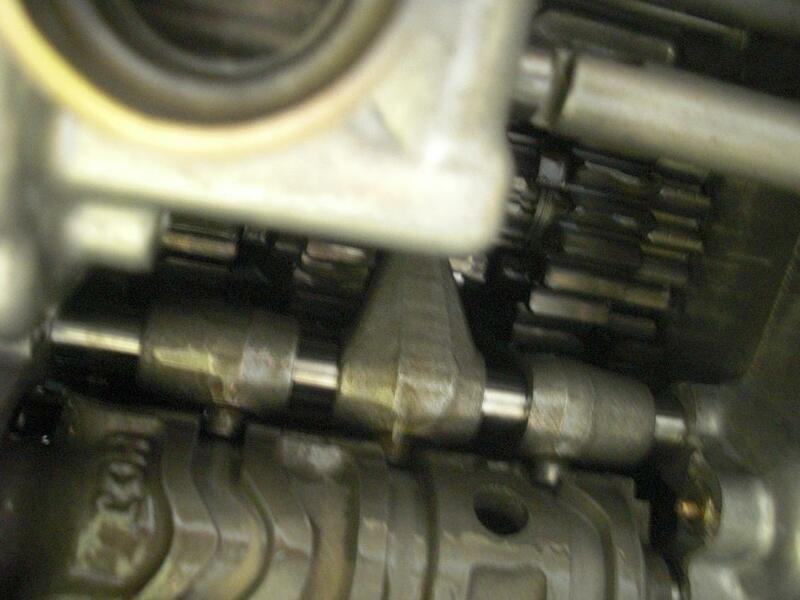 Clean the mating surface of the oil pan and engine case. Apply a thin layer of Ultra Black silicone to the oil pan. Make sure the filter screen and oil pressure relief valve are installed and install the oil pan. Place one bolt on each end to hold the pan in place while you install the remaining bolts. Tighten the bolts in a crisscross pattern in 2-3 steps until secure. No torque is given in the manual so don't over tighten them. Once the oil pan is installed then torque the drain bolt to 22 ft/lbs. 26. Fill the engine with oil. It will take almost 4 full quarts since nearly all the oil has drained from the engine. 27. Check the clutch cable tension and adjust now is needed. 28. Install the exhaust system. I recommend installing new exhaust gaskets to prevent exhaust leaks. 29. Now its time to start the engine and check for leaks. After letting my bike run for a few minutes I took it for a short test ride to check the shifting up and down through all the gears. I will now let it sit for a day or two and check for any oil leaks before installing the bodywork. Pics 1-3 are during tear down. Pic 4 is new drum on left and old drum on right. More pics will be added below. 5 is limit per post. UPDATE: Since replacing the drum and shift forks a few months ago I have not experienced any missed shifts or the bike falling out of gear. I am also using an air shifter now at the drag strip with great results to ensure no lazy shifts from me. For anyone who is experiencing shifting problems with their 929/954 I would recommend changing these parts before removing the engine and splitting the cases to replace gears in the transmission. Thanks for the update, doc. I am removing the center clutch and the nut that is staked in isn’t coming out, I’ve tried to get it out with a breaker bar and the 30mm socket, and the ebc clutch removal tool and it’s just not complying. Any word of advice would be appreciated. Use an impact gun and it will come right off. Its tight but using the clutch holder tool you should be able to loosen it with a breaker bar. So after installing everything, when you pull in the clutch from the handlebar it is very loose and the clutch doesn’t snap back, any idea on what it might be? Pic #9 shows spring tail at 11 o’clock position. That’s 180* more rotation than what I used. I’m installing factory pro shift kit with their heavier spring, and it will be a Royal pain to put that much tension on the shift lever. Does the lever require that much pressure? I’ve seen other photos with the spring tail at 5 o’clock on the shift drum retainer bolt boss.